Torque, in simple terms, refers to tightening force. Safety critical automotive components always have specific manufacturer’s torque settings stating the amount of torque that is required for their fasteners. Using too much force will result in damage to the fastener or damage to the mating parts. Similarly, use too little torque means giving a bolt the opportunity to back out or shear off when the bolted joint is loaded, resulting in a potentially catastrophic and dangerous failure. While this may not be a huge issue for something insignificant like a glove box latch, it is most certainly a consideration for safety critical items such as brakes and suspension components. As such, it is supremely important to ensure that you use a torque wrench to apply the correct amount of torque needed when the job calls for it. Enter the torque wrench. 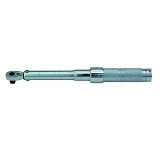 A torque wrench is a wrench that allows the user to accurately tighten a fastener to a torque they specify. Typically, you use one wrench and swap out sockets to match your bolt size, similar to how you would use a ratcheting socket wrench. 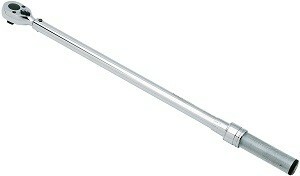 Torque wrenches come in many different forms, however those types used in the automotive industry are the most common. In this guide, we will talk you through the finer points of buying a torque wrench to help you make a smart decision about which is the best torque wrench for your needs. Below is a quick reference table designed to give you quick and easy comparison before we dig deep into the nitty gritty. The table consists of the makes and models of some of our favorites, as well as relative pricing and average rating. If you want a more in depth look feel free to skip ahead. However, if you are just looking for a quick recommendation, this table is for you. 1/4″ Drive – This is for extremely small nuts and bolts and a suitable range for automotive work is 50 to 250 inch-pounds (which is equivalent to 4 to 21 foot-pounds). 3/8″ Drive – Most nuts and bolts on the majority of automobiles and light-trucks can be torqued to spec with this size. A suitable range for automotive work is 15 to 75 foot-pounds. If you can only get one size, this one won’t quite cover everything but it will be the most versatile. 1/2″ Drive – Larger nuts and bolts for things like suspension, engine mounts, transmission mounts may require a wrench this size to torque appropriately depending on the type of vehicle. A range of 30 to 250 foot-pounds is suitable for automotive work. 3/4″ Drive – This size is reserved for special applications, such as center-lug wheels. Most people don’t need a wrench this large, but every once in a while someone might have an application. You should choose a range specific to your situation. You may have noticed that there is some overlap between the ranges above and thought, why not just get the biggest one with the largest range? The reason is that as your torque demand increases, so does the size of your wrench which can make it harder to maneuver in smaller spaces where most automotive work takes place. Additionally, while it’s easy to imagine a lot of extremely tight bolts with triple-digit torque specs on a car, the reality is that most bolts are torqued to numbers much lower and we find a smaller wrench that is easier to work with is often worth the tradeoff of sacrificing a little bit of capability on the higher end of the torque range. Finally, torque wrenches are most accurate in the middle of their range, so you want to choose your range accordingly. Click-type torque wrenches are the preferred choice for automotive work for most garage and professional mechanics alike. When the correct amount of torque has been applied, you will feel and hear a click notifying you of the correct amount of torque (which means you don’t need to see a gauge with your eyes when you are contorted like a gymnast under your car while tightening a hard to reach bolt). It is important that you do not apply additional torque once you hear the click, as even though the right torque has been reached, the wrench does not prevent you from exerting additional force. These are our favorite and the type we recommend for most automotive work. 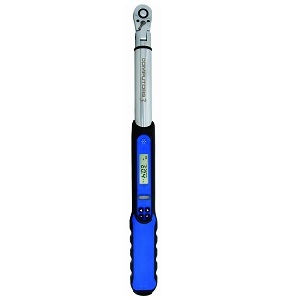 Electronic torque wrenches, also known as digital torque wrenches, work on the exact same principle as click-type torque wrenches, however instead of clicking they make a beeping noise. Electronic torque wrenches provide both an audible notification once the correct torque is reached and a digital reading of the torque. They also sometimes have cool features such as memory, max torque applied, etc. As you would expect, with added features comes added cost. We find that we don’t really take advantage of the bells and whistles that electronic torque wrenches have and as such, they don’t justify the cost premium over click-type. That said, they are still great if you need the features or don’t mind spending the coin. Beam torque wrenches are the oldest and most simple form found, but perhaps the least accurate and least reliable. With this type, a beam flexes against a visual indicator gauge as you torque which shows you the amount of torque that is being applied in real time. Beam torque wrenches are often the most cost effective, and in turn make a great choice for those that do not see themselves using a torque wrench all that often. It should be noted that although cheap, beam torque wrenches are commonly heavy. You have to visually watch a gauge which makes these a little more cumbersome to use and only as accurate as your hand-eye coordination. This is our recommendation only if cost is the driving factor. The following is a list of features and facets to be aware of when searching for a torque wrench, as brand to brand and price point to price point these will vary. Manufacturer’s Warranty: A good torque wrench will always have a manufacturer’s warranty of at least 1 year, but many of the higher tier brands have warranties that last much longer. Accuracy: Torque wrenches have varying accuracy. The good ones have an accuracy of better than 5%. A good torque wrench will come with a certificate of calibration stating date and accuracy. On that note, torque wrenches should occasionally be recalibrated per the manufacturer’s maintenance schedule to maintain factory accuracy. Note: A torque wrench is a calibrated instrument and should occasionally be serviced per manufacturer’s recommendations to maintain factory accuracy. If you drop a torque wrench, you should calibrate it to verify accuracy. It is also important to store your torque wrench per the manufacturer’s recommendations as the way it is stored can affect accuracy. Take care of your torque wrench and it will take care of you! Materials: Cheaper torque wrenches are going to have substantial amounts of plastic. While these work just fine, metal constructions are going to generally be more durable. Ratcheting: Ratcheting is a huge convenience, particularly when it is bi-directional (clockwise and counter-clockwise) for fasteners with both right-hand and left-hand threads. Most click type and electronic torque wrenches have this feature whereas beam-type typically do not. Storage: A hard case is ideal as soft cases tend to allow your wrench to get more banged up and potentially knocked out of calibration. Hard cases are typically plastic and work great when it comes to protecting your tool. Scale Visibility: Whether it’s a mechanical twist handle setting or a digital readout, save yourself some headache and pick one that’s easy to read and set. Grip: Look for a tool that has features that allow for easy grip. Remember, you could be working when your hands are covered in fluid, and a slippery torque wrench can be quite frustrating. Here we have compiled an overview of the four best torque wrenches available, each giving you the best value for the money and each excelling in its own right. We have laid out options suited to hobbyists and professionals alike. This dual scale, click type torque wrench features outstanding quality of craftsmanship granting you excellent durability. The dual scale is calibrated in both directions, being accurate to 3% CW, 4% CCW of the displayed value. Measures are provided for both foot-pound and Newton-meters, each marked on either side of the handle. Giving you a torque range of ten to one hundred foot pounds, this CDI torque wrench is both easy to use and easy to read. The scales are laser marked and quick release buttons are featured, allowing for great socket retention and simple socket removal. The grip is highly effective, with nice knurling never allowing any slippage. The ratchet head locks to three positions, forward, reverse and a center setting whereby it is not ratcheting. The click notification is clear and easy to hear and feel, while adjustment is smooth. Should you have any questions, or require after-sales support, CDI is reputed to have fast, friendly and highly-effective customer support desk. A carry case is provided that also included the measures needed for calibration. One should note that the accuracy of this reliable CDI torque wrench is backed by N.I.S.T. certification, which is included when shipped. Having the certification gives the user great peace of mind. 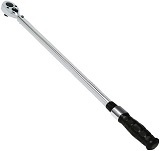 For a professional torque wrench, made in the U.S.A, the CDI 1002MFRMH 3/8-Inch Drive Metal Handle Click Type Torque Wrench is a top tier option. It is easy to use, easy to clean, durable, affordable and extremely accurate. This one’s our all around favorite. 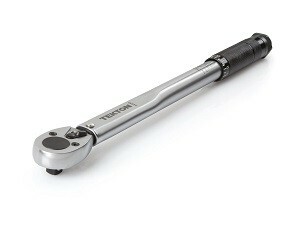 The Tekton 24335 1/2-Inch Drive Click Torque Wrench has one of the easiest to read, highest-contrast scales available. It is durable simple to use and perfectly suited to both DIY enthusiasts and professionals alike. The rugged yet stylish quality is obvious, being immediately noticeable from the steel construction and the reversible chrome vanadium ratchet head. It is also coated to prevent corrosion from occurring. Accuracy is spot on, with a calibration accuracy of within 4%. It is capable of providing up to 150 ft-lbs. of torque. Tekton has ensured a non-slip grip thanks to the innovative design of the knurled handle. One can both hear and feel that the correct amount of torque has been reached with ease, clearly giving you the indication that you need to prevent to torque properly. The Tekton 24335 1/2-Inch Drive Click Torque Wrench is shipped fully assembled and ready to use, housed within a sturdy carry case. The carry case provided is a great asset, giving you a well-manufactured storage medium that will withstand the knocks of a busy workshop. 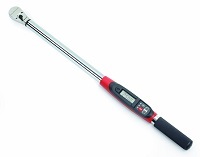 This great torque wrench gives you dual range, both foot-pounds and newton-meter readings. It is also backed by a lifetime replacement warranty and their after-sales support is outstanding. This torque wrench from Tekton is a simple, straight-forward design which works reliably for either daily or occasional use. For use on cars, SUVs, tools, or even garden equipment or other small to medium-sized applications, you can’t go wrong with this highly affordable and effective torque wrench from Tekton. This one is our pick if you are on a tight budget and it should be noted that Tekton makes a similar wrench in 3/8 drive, which can be found here. The CDI Torque 3/8-Inch drive Computorq 3 electronic torque wrench is both a pleasure to use and feature packed. Torque readings are displayed in real-time in any of the four torque values available, namely ft-lbs, in-lbs, Nm, Kg-cm. The head features the ability to flex 15 degrees, which is great for those places where it is particularly hard to maneuver. Operation is easy, simply set your torque and then apply force to your fastener until the LED illuminates green and a beep is emitted. As you approach the required force, the LED illuminates orange, helping a lot to ensure that you do not exert more torque than is needed. Should you exceed the torque that you set an alarm sounds to notify you. It is a highly accurate torque wrench that gives a great low end range of 5-100 foot-pounds. The CDI 1002CF3 Drive Computorq 3 Electronic Torque Wrench runs on lithium ion batteries and the battery cap is well designed and well positioned. Battery life is really good, with a set of batteries lasting you many hours more of operation compared to competing products. The ergonomically designed rubber handle makes using this torque wrench a pleasure to use. The accuracy, quality and durability of this great electronic torque wrench makes it a feature packed choice for any professional, especially useful for assembling motors and other machinery that requires precise torque values at odd angles. 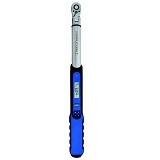 It is often said that once one uses an electronic torque wrench, it will be hard to go back to using any other type! This is our pick if you have to have the best and are willing to pay the price for quality. Stanley Proto J6064C 3/8-Inch Drive Ratcheting Head Micrometer Torque Wrenches are perfectly suited to industrial and automotive use. The torque is rated at 40 to 200 inch-pounds. It is extremely accurate, rated at within 3% at a clockwise direction and 6% counter-clockwise, from 20% to 100% of the full scale. As with all Stanley tools durability and quality of craftsmanship is top notch. 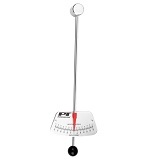 A linear scale gives easy offset readability, while dual scales are provided for convenience. Calibration is retained for 30,000 cycles. The grip is really well designed, never allowing your hand to slip while using the torque wrench. The entire composition is steel, clearly exhibiting its durable nature and ensuring that every last facet of its design is rugged and long-lasting. The Stanley Proto J6064C 3/8-Inch Drive Ratcheting Head Micrometer Torque Wrench is an extremely precise tool that carries matching durability, backed by a manufacturer warranty. This Stanley Proto torque wrench is sure to last you many years of excellent service, with no replacement needed at any point in the foreseeable future. It is supplied with a plastic carry case which matches the rest of the Proto range. No plastic is present in the construction of the torque wrench itself from what we can tell, which is a great sign from the start. All around it’s a great torque wrench and a very viable alternative to CDI wrenches. Torque wrenches are an essential tool for anyone that works in the automotive industry. It is critical to correctly tension the bolts and lug nuts of engines and other automotive components. Regardless of which type of torque wrench you choose be certain to pick one that meets your needs. Most good torque wrenches are extremely rugged and will grant you many years of operation so long as you keep your torque wrench clean and maintained. Be sure to carefully assess your needs when shopping for a new torque wrench as it is not a tool that you are likely to replace any time soon. Often it is better to opt for a wrench that gives to a higher degree of versatility and ease of use, as opposed to one that is cheaper. Regardless of which type of torque wrench you choose, it is an essential tool to anyone that carries out automotive maintenance and repair tasks, making it a definite must-have for any mechanic or DIY enthusiast. If none of the above seem to suit you, check out some more torque wrench options by clicking here where you can read reviews and get a feel for prices. Happy wrenching!